Natural Spaces Domes manufactures a complete line of skylights for dome homes. The beauty of the dome is definitely enhanced by our ability to place skylights in any one of its triangles. Shape and size are not constraints. We bring the outdoors inside thru crystal clear float glass. We can flood that would-be dreary room with light all day, the moon at night and have a place for your favorite hanging plants. Our skylight system was designed with only domes in mind. We didn’t have to compromise any details. 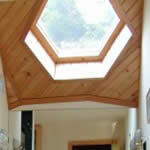 There simply is not another custom dome skylight as versatile, watertight and maintenance free. Why a Natural Spaces skylight? We know that any window on the dome surface must be treated as a skylight. It has to be designed so that the flashing integrates properly with the roof shingles. It has to be positioned for proper solar orientation. The shape and grouping should fit the size and mood of the room. We custom design each skylight on every dome. Using a multitude of basic sizes that match the angles of each dome triangle, we achieve the correct grouping and placement for your particular dome and site. We custom design your skylights with options such as Low ‘E’ coatings, argon gas, solar tinting, high altitude breather tubes, and more. Because we use glass instead of plexiglas, your view is always scratch free and without any yellowing of the view material. 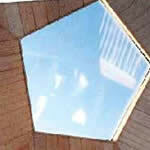 Creating energy-efficient skylights. The key to the energy advantage of skylights is that they make direct use of the sun’s light, transmitting solar light to reduce the demand for electricity for lighting, while efficiently utilizing the sun’s heat to function as a passive solar collector. Triple pane construction combined with solar lighting and heating effects, offset the ”energy negative” of heat conduction thru the glass. Natural Spaces Domes has been manufacturing dome skylights since 1978. Our quality, warranted skylights set our dome apart from our competition. We won’t leave you in the dark – we want your dome home to be bright and cheerful. We match our triangle windows to the particular dome panel they are put into. The 30’ to 40’ diam. domes have 3 different panel sizes while the 42′ to 51’ diam. domes have 6 different sizes. We then have window sizes within each of the panels that go in 4″ increments. For every triangle in the dome, there may be 20-30 window sizes. Generally, triangle skylight sizes run from a base 36” wide to sizes with a base 90” wide and an altitude 78” high. This is a very appealing skylight for upper floor areas like bathrooms, dressing rooms, etc. Our hexagon windows that fit within the dome panel generally run from 24” tip-to-tip sizes up to 52” tip-to-tip size. We also make super large hexagon windows that fit over the point where six triangles come together. These sizes run from 48” tip-to-tip up to a maximum of 84” tip-to-tip size. This 5-sided shape only fits in the 5 pentagon groups of triangles. In the low profile dome, these are on the main floor. In the mid and high profile domes, these are on the upper level. Strut parts are removed to install these units. The trapezoid shape is used primarily on the main floor where counters cut off the lower part of the triangle – over a kitchen sink is the most popular, or, on the first row of triangles where the upper floor cuts off the full triangle. The exact shape of the trapezoid is matched to the shape of the triangle panel it’s in. The height and width of the trapezoid are custom sized and depends on physical interior factors and outside views. Natural Spaces insulated glass windows are available in double, triple and four pane systems. We use 3/16” and 1/4″ thick tempered glass, which is 5 times stronger than plate glass. Our skylights have made it thru hail storms where conventional 1/8” thick tempered glass skylights were blasted out. By using glass instead of plastic, our windows remain crystal clear forever. We also have a 3/4″ air space between each pane creating one of the best insulating ratings obtainable. Low ”E” and argon gas are also options. Around the entire window is a perforated “warm edge” spacer channel containing Silicate, a dehydrating agent, absorbing any moisture that happens to be between the panes. The entire glass edge is hermetically sealed with a dual seal, applied under controlled conditions, to provide protection against any vapor penetration. The glass unit is manufactured and guaranteed against moisture between the panes for 5 or 10 years by one of the nations leading insulated glass suppliers. If, for some strange reason, it fails, it will be replaced, free of charge. Our 2×4 wood frame is actually a structural frame. No interior framing or bracing is required – simply mount the frame on top of our plywood skin, then lag screw thru the plywood into the #1 grade southern yellow pine frame. Another feature is the 5 1/2 ” long flashing extending out from the window on all sides. Prefinished (33 colors are available), this flashing ensures a proper seal with the roofing. Some of our competitors’ skylights come with only a 2” leg – barely enough to slip under or over the shingles and not enough to keep out wind-driven rain. Natural Spaces uses a special bronze anodized aluminum extrusion between the glass and exterior flashing. We use Tremco butyl tape sealants – the same type used in high-rise buildings. The “top cap” is secured using stainless steel screws and washers. So sure are we of our design, that we offer a 5-year guarantee against any rain leakage thru our frame or flashing assembly. We want to produce a true maintenance-free, long-lasting, good-looking, energy-efficient window – and we think we’ve done it. Skylights come assembled with flashing and a top cap attached, ready for installation. Zinc plated lag screws and washers are provided (for mounting from the inside). Additional 12” wide water-proofing membrane (for wind driven rain) included. Foam tape sealant provided for eliminating air infiltration. Windows can be picked up at our North Branch shop without crating or shipping charges. Small to medium size skylights can fit in a mini or standard pickup truck. Larger skylights require and open trailer. For shipment on common carriers, windows must be completely boxed in a custom wood crate. There is a base charge of $100 plus additional crating charges of $25 to $100 per window depending on size and quantity. There are no crating charges if shipped with your dome shell in the same semi-truck. There is a ten-year guarantee against moisture between the panes on all units installed at less than a 15-degree slope from vertical. There is a 5-year guarantee against moisture between the panes on all units installed at more than a 15-degree slope from vertical. We think you will agree – Natural Spaces Domes offers the widest variety, most options and highest quality of any dome skylight. Click on individual boxes below for information and prices. Triangle Skylights Dome Sizes: 16′ – 29′ diam. Triangle Skylights Dome Sizes: 30′ – 40′ diam. Triangle Skylights Dome Sizes: 42′ – 51′ diam. Trapezoid Skylights Dome Sizes: 20′ – 74′ diam. Hexagon Skylights Dome Sizes 20′ – 74′ diam. Pentagon Skylights Dome Sizes: 20′ – 74′ diam. Skylight Options Low E, Argon, Tints, flashing colors, etc. Skylights can be grouped for passive solar gain. Or, skylights can be grouped continuously for panoramic views.